I'm actually caught up on my Horn Book reading. What I am is behind in telling the world about it. So I'm just going to take a quick dip into all my Horn Book thoughts. Too much of a good thing and all that. 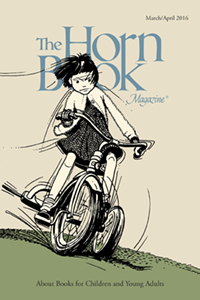 The Beverly Cleary Birthday issue also had a very interesting article by Betty Carter called Escaping Series Mania. (Oh, wow. I just realized. Cleary wrote series.) Carter suggests that "An exclusive diet of early series books might limit rather than expand reading competence." Because series books are so predictable--same narrative voice, same characters, same situations--readers aren't being exposed to much that's new, to much that will push them as readers. Instead of using their reading skills to help them comprehend what they're reading, they use what they already know about the series to do that. Well, I thought that was fascinating. 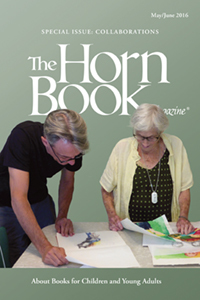 At the back of this issue is a two-page selection of reviews of narrative nonfiction from The Horn Book Guide. 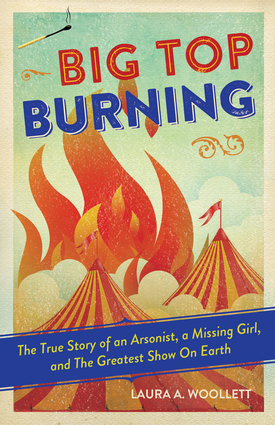 Included is Big Top Burning: The True Story of an Arsonist, a Missing Girl, and the Greatest Show on Earth by Laura A. Woolett. Woolett is writing about what's known in these parts as the Hartford Circus Fire. It is impossible to exaggerate how large that disaster has loomed in central Connecticut history. And I'm speaking as someone who wasn't born when this happened and didn't move to the area until 35 years later. Just sayin'. My favorite article from the collaboration issue was Translator: Trafficking Between Cultures by Elena Abos. When you consider that it's all I can do to read the French jokes my cousin e-mails me, I seem to have a bizarre interest in translation right now. 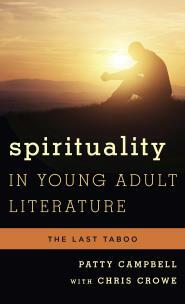 In the Of Professional Interest section of the magazine: Patty Campbell (with Chris Crowe) has written Spirituality in Young Adult Literature: The Last Taboo. Campbell used to write regularly for The Horn Book. I loved her columns. Roger Sutton and Sian Gaetano have a podcast. I listened to one during a cooking binge. I don't know which podcast, I'm sorry to say. I made a couple of notes that don't include that information. Here's the information I did take down: Sutton said that book reviews are news. A newly published book is news because...it is new. The reviewer is reporting on news. I have never thought of reviews that way, but this makes the incredibly narrow window for getting attention for new books make sense. That is the period of time when those books are new and news. It still stinks for the hundreds, if not thousands, of books that won't be considered newsworthy enough (due to content, the writer's history, etc.) to be professionally reviewed. But at least now I have a better understanding of the stinkage. Oh, thanks for the heads-up on THE LAST TABOO. Ashley Pérez and I were discussing religion the other day in reference to her in-process book, and we both were having the feeling that we were walking on thin ice... and yet, OTHER topics have been explored thoroughly. I shall have to check it out. I don't think there's a lot of recognition of religious observance/instruction among children/YAs, forget about real spirituality or a belief system, in children's books. Large numbers of children, of all kinds of religious backgrounds, receive formal religious instruction of some sort, for some period of time, even if it doesn't "take." The act of going to class becomes part of the child's personal history, for good or bad, even if the content of those classes didn't have an impact on them.